All those dark spots underwater are stingrays! Several companies offer daily boat tours; Captain Marvin’s is the oldest. Marvin is a real person, and he started bringing tourists to this spot back in 1951. We were picked up at our hotel, and brought to the dock to meet the rest of our group of 20. 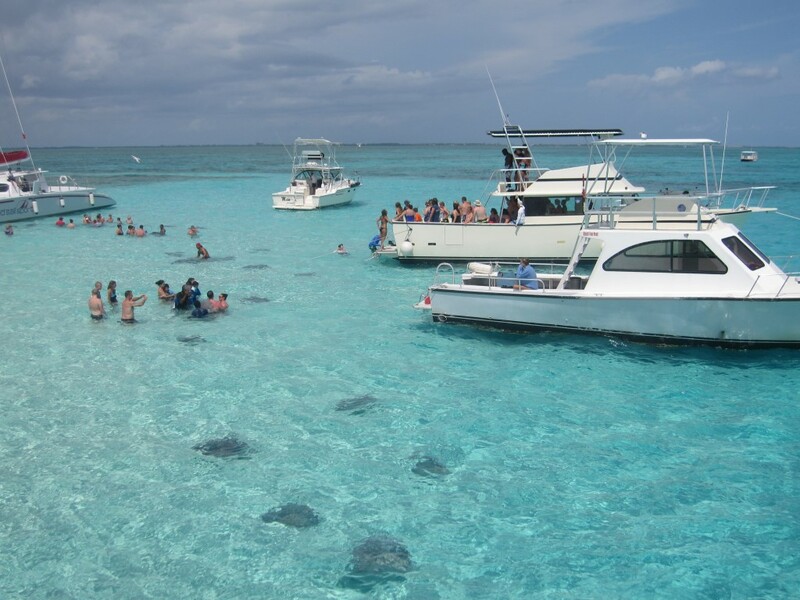 We took a three-hour tour with three stops: Stingray City to interact with the rays; and two great snorkeling spots called the Coral Gardens and Barrier Reef. It’s surreal to be walking around in this waist-deep patch in the crystal clear sea among scores of stingrays. The first time one of these creatures slides across your legs, you may let out a little squeal. Or you may scream like a possessed little girl. I will kiss him and love him and squeeze him and call him George. The tour company provided us with pieces of squid to feed them. You’re supposed to hold it flat in the palm of your hand, while holding your hand still under water as they glide over it and slurp it up. In theory. The Girl was braver than her mother and at least tried, but ended up dropping it as the ray approached. 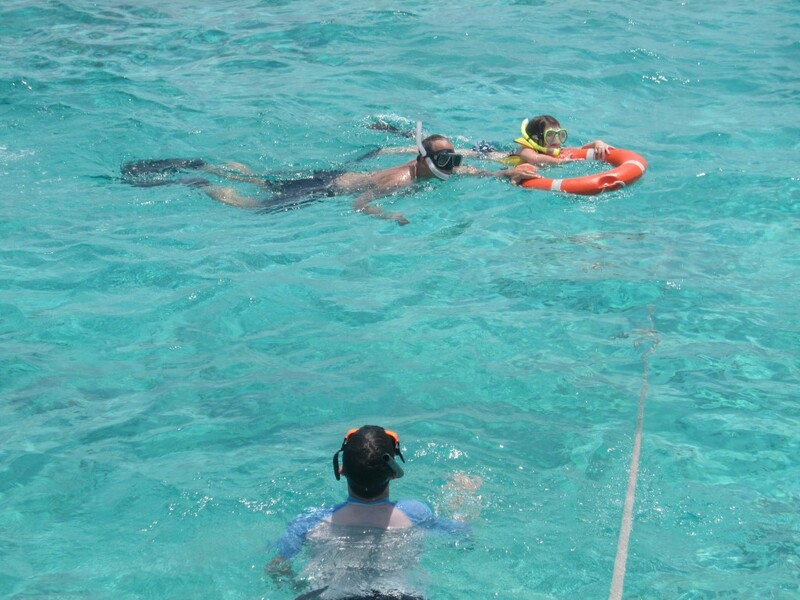 Both our kids were even braver when the opportunity came to snorkel. What was the source of their fortitude? Was it the sunshine? The salt air? Or just crazy curiosity to see what was under those turquoise waves? They were different kids that day, and I was so proud. 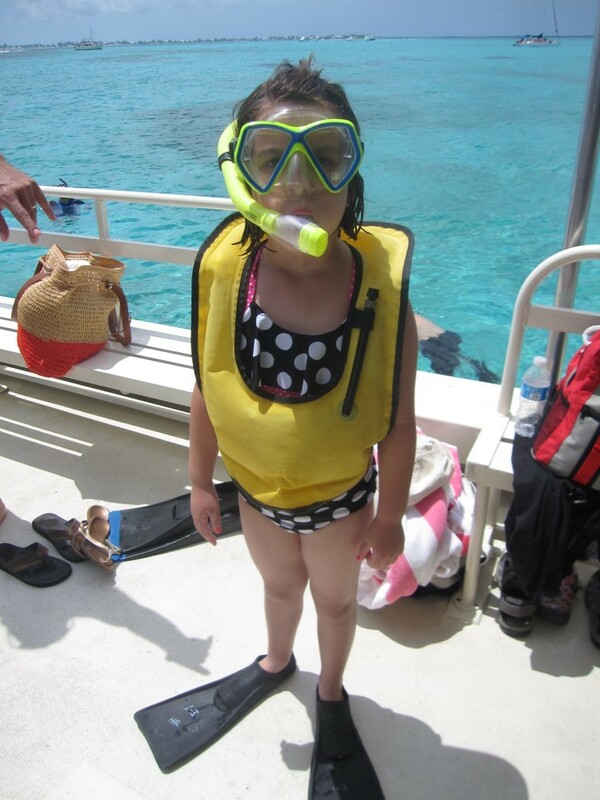 During the two snorkeling stops, we used the masks, snorkels, and flippers supplied by the company. 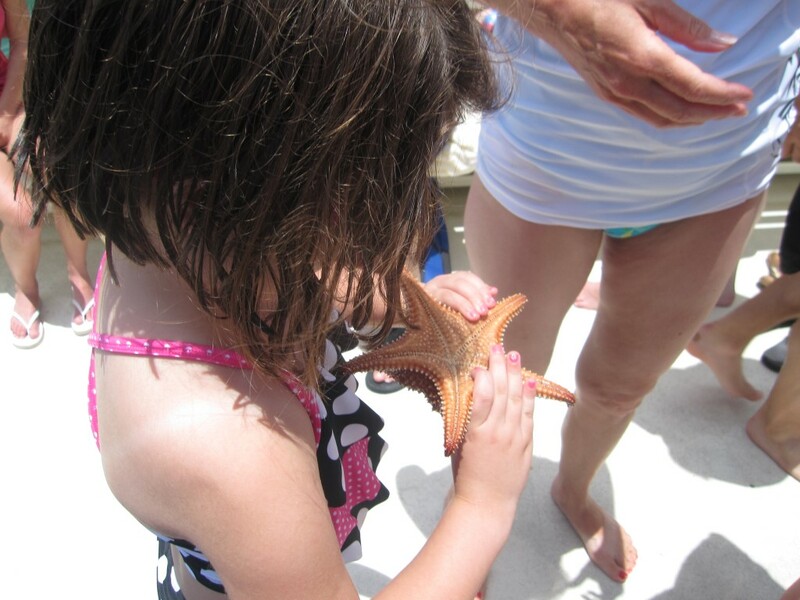 This was their first time snorkeling, and they loved it once they got the hang of it. Above and beyond several types of brightly colored fish, like Blue Tang and yellow-striped Sergeant Major Damselfish, there was coral in all shades of blue and purple. We’ll be going to another warm, tropical Caribbean destination this summer. Can’t wait to tell you about it! In the meantime, I’ll warm my hands by the monitor. I admit, feeding the sting ray was just a bit scary as they’d flock around us, almost fighting of over our offering of fish. After feeding one, my teenage daughter refused to feed another for fear she’d lose fingers. 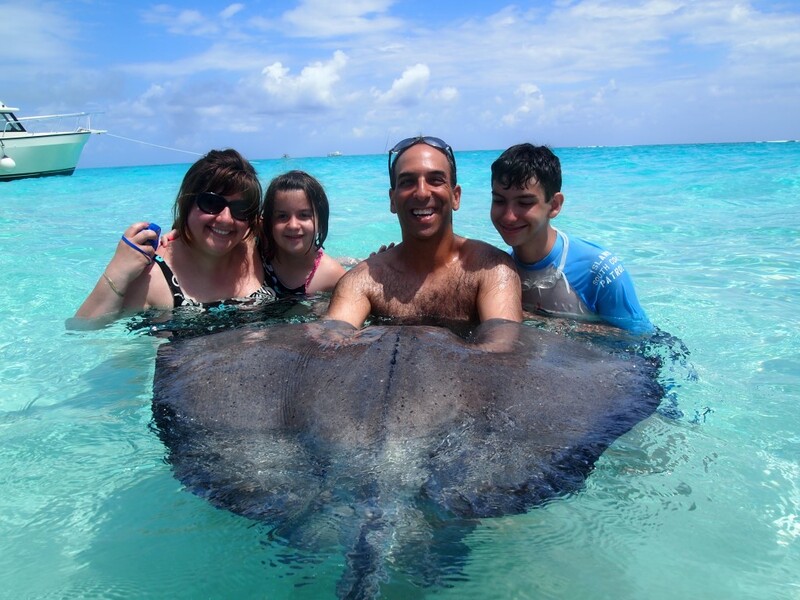 That family photo of you all with the sting ray is out of control! You are SO much braver than I would be. Should have been your christmas card photo!!! It DID make the Christmas card! Hoping to top it this year with a photo of us swimming with the dolphins! Looks very fun. I like the idea if swimming with the marine animals. That is an amazing adventure. thought Stingrays are from Sharks Family. Seems an amazing adventure. Must be exciting fun for your family. 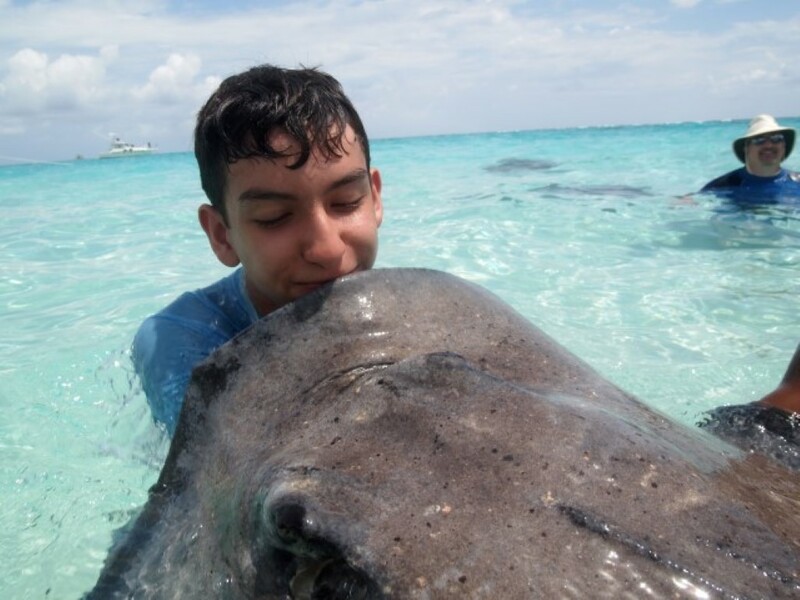 The pictures are amazing, Cayman Islands is a paradise, the idea of swimming with marine animals sounds exciting. Whe is the best season to go and visit?